A curated selection of short film artworks chosen for their alignment with poetic structures and experiences, and with the visual, verbal and aural languages of poetry in various forms. Parallax is the apparent displacement, or difference in the apparent position, of a visual object, when viewed along different lines of sight. In his book Transcritique, the Japanese philosopher Kojin Karatani uses the word parallax to describe Kant’s shifting between contradictory perspectives. Kant’s »Antinomies of Reason« are contradictory propositions, which seem valid from their own perspectives, but which cannot be simultaneously true. Kant argues alternately from one perspective, then from the other, and Karatani describes Kant’s approach as establishing a parallax between philosophical positions. Karatani asserts that parallax does not equate with negativity, but it does not negate negativity either. The basis of parallax is the positivity of both positions. Slavoj Žižek argues that in Karatani’s concept of the parallax view, the observed difference is not simply subjective, but that the viewer’s change in perspective reflects an ontological shift in the object itself; »the subject’s gaze is always-already inscribed into the perceived object itself, in the guise of its ›blind spot‹, that which is ›in the object more than the object itself‹, the point from which the object itself returns the gaze« (Žižek, The Parallax View, 2006). »Sure, the picture is in my eye, but me, I am also in the picture« (Jacques Lacan, The Four Fundamental Concepts of Psychoanalysis, 1979). Room service for the spirit. A one-take dream in Cocteauesque monochrome. The film quotes the poems Night Tree by the experimental poet and filmmaker Len Lye, and Ah Sunflower by William Blake, as well as Are There Not Twelve Hours of Daylight, as quoted in the painting of the same title by the painter Colin McCahon. The film was hand painted directly onto 16mm and 35mm film, and is combined with hand drawn text and other archival footage to foreground questions concerning time, ecology and human consciousness. An exploration of celestial space translated into sound space. How does each unit interact with the cosmos where it belongs? How does it react to its law? How does it transform itself, integrating with the system, until the loss of identity? In contrast, the constellations stand as a classification and articulation device of the individual inside the system. A kinetic concrete poetry film using Paul Eluard’s poem Liberté as a starting point, and featuring sound design by Tallulah Holmes. A film made on Super8 about the director’s deaf father going blind. The UK premiere of this film, which features three poems by Alejandra Pizarnik, was in April 2015 in a PoetryFilm programme called Transmutations. Taken from the artist’s ongoing Short Film Series, where image is valued over word as the primary source of reflection and enquiry. The neighbour’s washing line is seen through the window. The film was made by adjusting the aperture of the camera together with the brightness of the single light bulb. Featuring archive footage of televangelist Oral Roberts. A stop motion painting video artwork using painting, acting and narration. By linking seemingly disconnected identities, the artwork explores the relationship between creativity, ambition and death. The artist collective Pneuma is visual artist Francesca Ricci and musician Gaston Gorga. Salt Jar (translation) explores the boundaries between normality and its perception. Ksana’s hobby is trying to answer the tricky questions of life. A film of a kinetic Poemdrum by Liliane Lijn, whose work explores language, mythology and the relationship between light and matter. The poemdrum is 44cm high, 30cm in diameter, and made using laser cut steel, anodized aluminium, two motor turntables, and … light. Zata Banks is the founder of PoetryFilm, the influential research art project launched in 2002. PoetryFilm has produced over 80 events at cinemas, galleries, literary festivals and academic institutions – including Tate Britain, The ICA, British Film Institute, Cannes Film Festival, CCCB Barcelona, O Miami, and Curzon Cinemas. PoetryFilm lectures have been presented for the MA Creative Writing course at Warwick University, MA Filmmaking at The National Film & Television School, and MA Visual Communication at The Royal College of Art. Zata has judged poetry film prizes for the Southbank Centre in London, Zebra Festival in Berlin, Apples & Snakes poetry organization, CYCLOP festival in Kiev, and Carbon Culture Review. PoetryFilm is supported by Arts Council England, who recently funded the cataloguing of the entire project archive, which at present contains over 1,000 films. 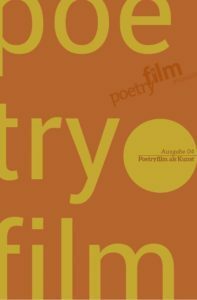 PoetryFilm is an accredited member of Film Hub London, part of the BFI Audience Network, and holds a trademark awarded by the Intellectual Property Office.